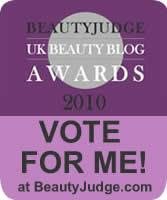 Dainty Dollymix UK Beauty Blog: UK Beauty Blog & Vlog Award, Ive Been Nominated! Before i reveal the winner of my 300 follower giveaway i just wanted to let you know that i have been nominated for a UK beauty blog & vlog award under the 'The Beauty Leader award'. Which is a category for bloggers who have 500 or more followers. The categories have been organised to encourage quality, not quantity. It’s not about who has the most followers, it’s about whose followers actually vote for them! I am extremely excited to have been nominated and i know already that some absolutely amazing girls, and some of my favourite blogs have already been nominated so well done and good luck girlies! It means so much to me because without all my amazing followers i wouldnt have been nominated for this award! Blogging is my passion and a hobby that i absolutely love! So all i am asking if you amazing and wonderful followers would vote for me, it would mean the absolute world! To all those that do vote, you have the opportunity to win an amazing voters prize, which is worth over £100 that includes some amazing goodies including MAC, soap & glory and Elizabeth Arden to name a few! Thank you to everyone in advance, i love each and every one of you, Thank you so much! Congrats hun :) I'm nominated for the under 500 followers one and I'm up against some amazing bloggers! Haha.